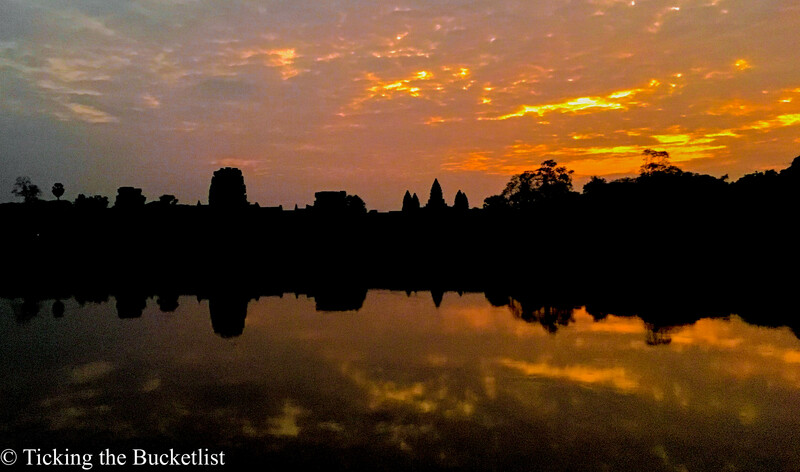 Do you want to watch the magical sunrise at the Angkor Wat? Almost everyone who visits Siem Reap wants to do the same… and there will be thousands of tourists to give you company. Don’t expect to have a quiet and serene moment of enlightenment as dawn breaks! But the funny thing is – even though you know that you will be surrounded by hordes of people at sunrise, there are high chances that you will still make your way to the gardens of the Angkor Wat to watch the sky turn purple, red and orange with the first few rays of the Sun. Want some company for the sunrise? 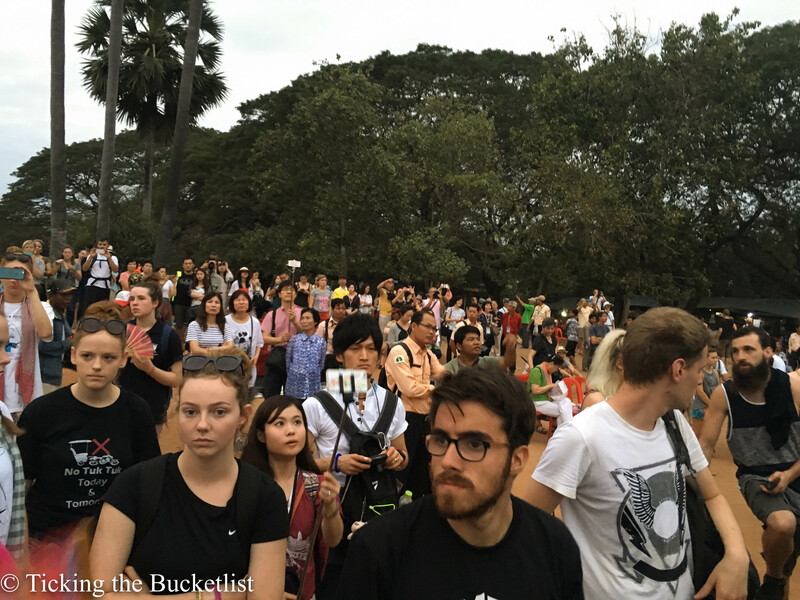 Reach early… really early: If you want to get a spot near the lily pond, you must reach Angkor Wat at least 1.5 hours before sunrise. Be there as early as possible, especially of you need to set up your tripod. 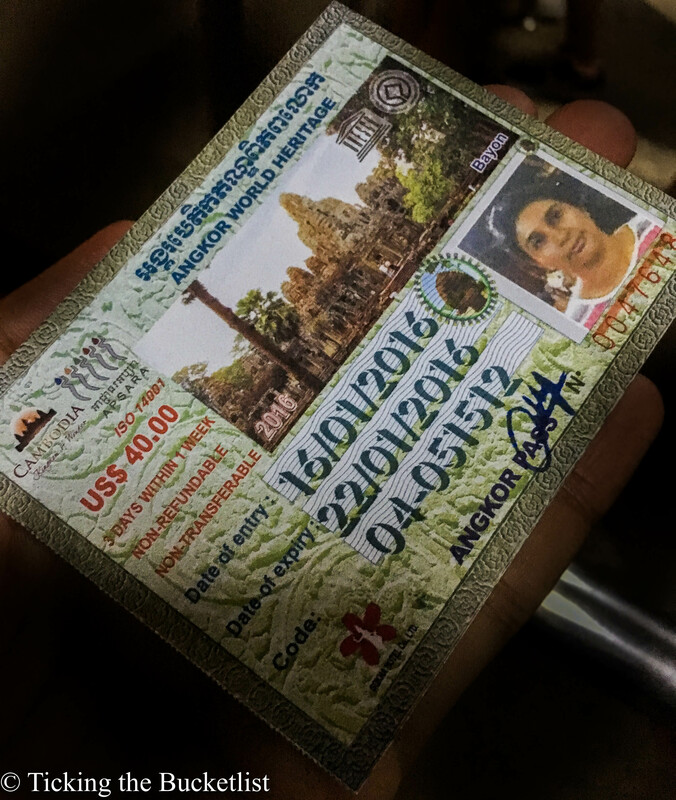 Buy the pass/ticket in advance: You would need the pass/ticket to the Angkor Archeological Park in order to visit the Angkor Wat. 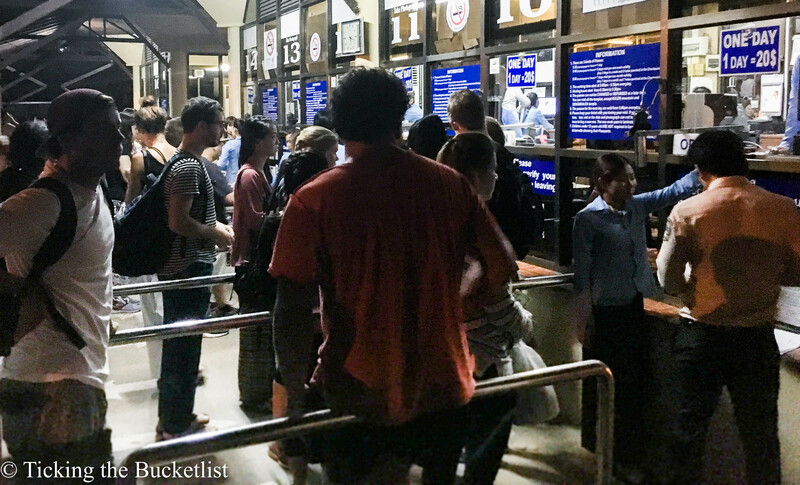 It would be best to have the ticket in hand at least the night before so that you do not spend time at the ticket counter in the wee hours of the morning. 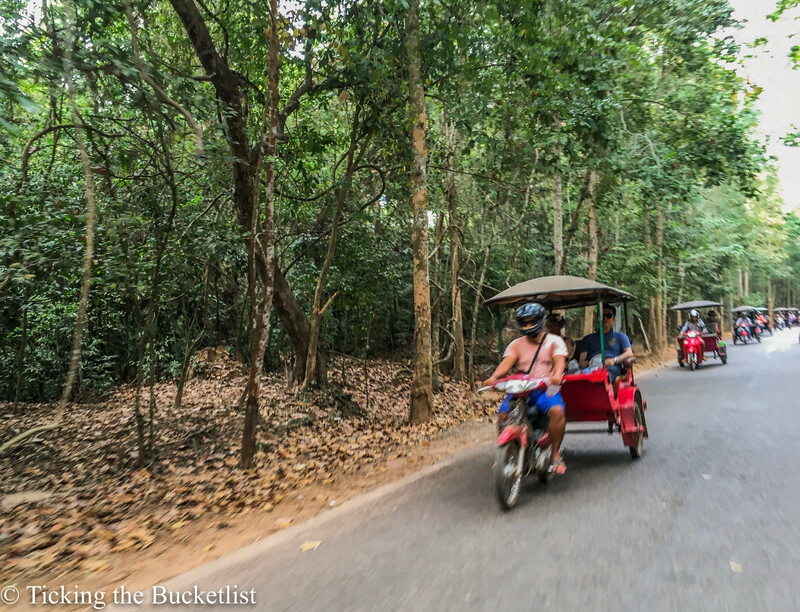 Arrange for a tuk tuk the night before: …preferably through your hotel/hostel. I requested the tuk tuk driver, who had shown me around the previous day to take me for the sunrise tour at be at the hostel by 5 am. He had gladly agreed and we had settled on a price. 5 am… and there was no sign of him! He had overslept and I was running around trying to find myself a ride. The hostel staff helped me in getting a tuk tuk and I did make it to the temple before dawn… but lost about 40 min in the commotion! Be at the correct pool to catch the reflection: During winter months, the reflection is best viewed in the left pool while during summer month, it is best viewed in the right pool (your left/right as you enter the temple through the causeway from the Western side). The pool to the right dried up often and you may not have that option. On the day of the equinox, the sunrises exactly behind the tallest tower and is best seen from the central causeway. Get your selfie stick: Okay… okay… the selfie stick sure is an irritant most of the times! 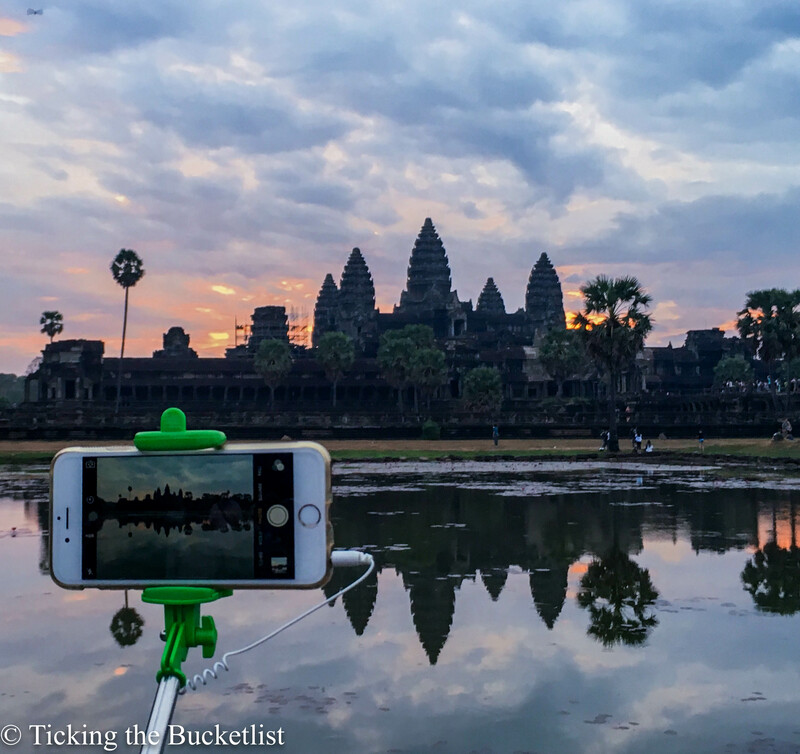 However, if you aren’t over six feet tall and haven’t reached a hour before sunrise, chances of you getting a shot of the temple and its reflection are slim…unless you have a selfie stick, which will add another three feet to your height. Having a selfie stick is a good idea! Carry a snack bar and water: Two hours of rigour to watch the Angkor Wat bask in the morning glory made my stomach rumble. I had intentions of exploring the temple after the sunrise when most people head back for breakfast. The snack bar and juice helped me tide over the hunger pangs. Watch the sunrise from a distance: If standing amidst the crowd isn’t your thing, plonk yourself on the steps around the moat and watch the reflection of the temple on the still waters. Carry a mosquito repellant: Mossies love me and find their way to my exposed skin, even in the dark. I was bitten on my neck and ears a couple of times; using a mosquito repellant cream/spray would be a good idea. Just because everyone does it, does not mean you have to do it! If you prefer to sleep and rest it out, do so. You will still be able to see the temple and its reflection in the pool during the day, albeit, without the colours at sunrise. I have also met many people who believe that sunrise at the Angkor Wat is overrated. I do not completely disagree with this… the crowds sure make the actual experience different than what one would expect by looking at postcards. Lastly, all postcard pictures have been enhanced using post processing softwares…and I have done bit of post processing too… the sunrise does look different in the real world. 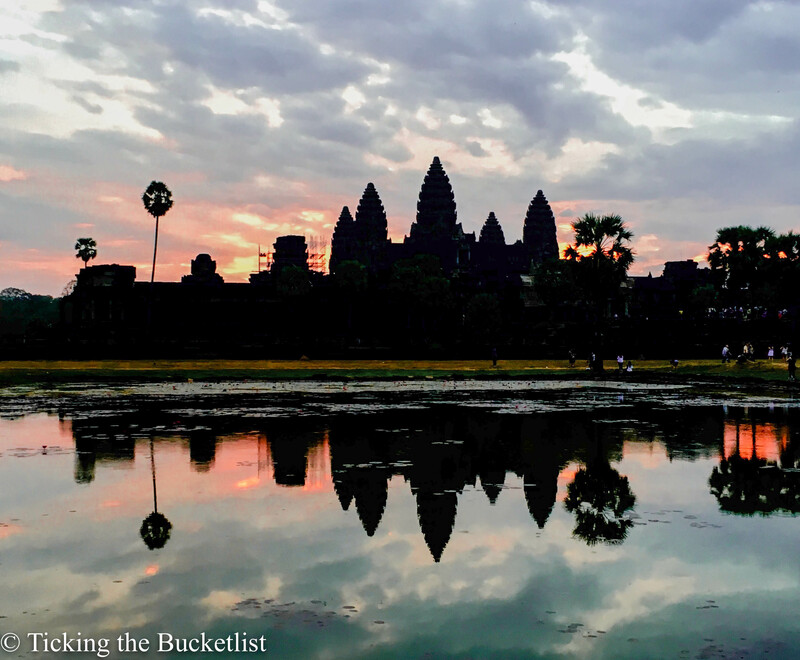 So, are you game to watch the Sun rise behind the Angkor Wat?